The Apple Watch comes in all manner of designs, but none quite like these. They're part of Goldgenie's Apple Watch Spectrum Collection. The best thing we can say is they'll make your Apple Watch stand out from the crowd. The models have a range of luxury finishes and materials, rendering the Apple Watch unrecognisable as an Apple product. Goldgenie has given its own collection names, though they're not quite as good as Apple's. The Apple Watch Diamond Ecstasy, for example. Apparently, this is a "dazzling rendition" of the Apple Watch Edition (the top-of-the-range one, whose price starts at £8,000). It's "perfect for those who are precious about their time". Basically, they've pebble dashed it with diamonds. There's a 1-carat one in the crown, and hundreds of smaller ones in the case and strap. It's either the "ultimate statement in luxury technology" or something Liberace would deem a bit much. Lucky for you, Golgenie has something more subtle up its sleeve. The Apple Watch Brilliance – see what we mean about the names? 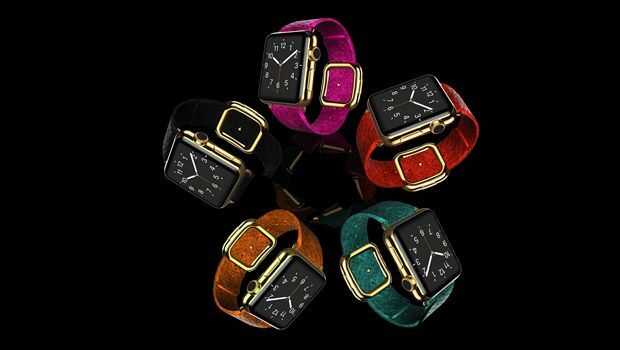 – sees the standard Apple Watch "embellished" in 24-carat gold, rose gold or platinum and Swarovski crystals. You can pair it with a link strap in the same metal, one with crystals, or leather, crocodile or python skin. Finally, the Apple Watch Elite is the same as the Brilliance, but without the Swarovski crystals. Relatively speaking, it's demure. Goldgenie counts P. Diddy, the Beckhams and Tyrese Gibson as among its customers. So if you want to be in their esteemed company, these are the watches for you. Prices start at £2,000. The watches will ship shortly after the Apple Watch goes on sale on April 24. Expect stares. Read more - You can pre-order the regular Apple Watch right now!